All philosophy and science stand for certitude through thinking. Logic and mathematics lay down the methods by which certitudes are reached when mere thought, unsupported by methods or calculations, involves varying degrees of doubt about the steps of thinking or research. Vedanta philosophy, or brahmavidya (Science of the Absolute) as it is more correctly named, is no exception to the rule. It seeks certitude about absolute Existence, Subsistence, or Value, compromised in one notion called brahman. (Brahman should not be confused with Brahma, the four-headed god of the Hindu pantheon). The Absolute, being by nature a mystery and a wonder, means that the teachings of Vedanta refers to a kind of philosophy that tends to be esoteric; but when it has been subjected to more critical, rational and intuitive treatment in the Bhagavad Gita, the subject matter attains to a fully philosophical status both from esoteric and exoteric norms of thought. Both priori and a posteriori means of valid reasonings are employed in Vedanta to arrive at the finalized finds (or lakshya) of the Vedantic research or inquiry. These may be said to be answers to the two most generalized problems of all philosophical inquiry; two grand questions arising ever and everywhere in the human understanding — about one’s own self and the world we see around. Vedanta follows such wholesale lines of inquiry and boldly claims to hold the answer to these questions, which is more than the most intrepid of modern analytic philosophers dare to claim. Indians have had no reason to divorce religion from philosophy to the extent Europeans had to due to the extremes and excesses of the dogmatism of the Middle Ages. The horrors of the Inquisition were a nightmare that haunted the conscience of the West, which can vie only with the cruelty and injustice of the caste system that has persisted in India. Both have tended to drive a wedge between aspects of spiritual life which, without them, should have belonged together as one discipline or expression of aspiration of Truth or Freedom. As a perennial philosophy, Vedanta tries to steer clear of historical and other considerations, and thus has a global, integral and unitvely comprehensive character of its own, though with its own necessary methodological, axiological and epistemological peculiarities which are widely evident throughout the song of timelessness — Srimad Bhagavad Gita. Advaita Vedanta or more simply Advaita philosophy which is expressed through this sublime hymn of dialectics, when revalued and restated, can give us the norm and reference, both theoretical and practical, of a way of life and certitude that can claim a fully scientific status, while being a complete philosophy in its own right. This great masterpiece of contemplative philosophy, whether we take it to be a “celestial” or “divine” or a “simple” song sung by God Himself, whether we take the two adjuncts in “God’s Song” as equally applicable, as a double epithet to a favourite philosophical work so popular with the masses of India, the main fact for the lay reader to recognize would be that in the Gita we have a highly philosophical work which has gained the status of an elevating scripture on par with the Vedas and the Upanishads. The Gita may be said to be the finest flowering of wisdom, pure or applied, which is sublime and precise at once. Its growing popularity through the centuries and even in modern times is sufficiently explained not so much by its cherished position among the religious textbooks of the Indian people in any closed or static sense, but because it highly deserves, by its universal appeal and by the high hope it holds out to all mankind, a permanent place among works referring to perennial and contemplative wisdom, which can know no barrier of race, religion or tradition. Throughout the Gita we are able to recognize a certain antique and somewhat outmoded yet time-honored type of reasoning known as Dialectics, which has close similarities to the method of Yoga as intended by the author of Gita. Yoga and Dialectics have very much in common. 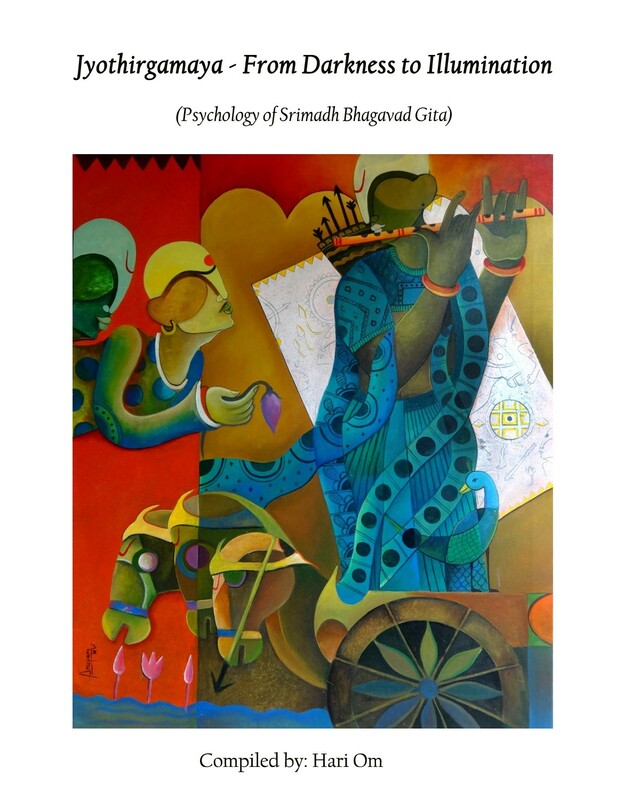 When the dialectical character of the treatment of the Gita is understood, a door then opens automatically leading to the solution of many enigmas that have puzzled commentators throughout history. The yogic method of equating, balancing or cancelling out the counterparts belonging to an argument or a situation in life has a tradition dating back to antiquity in India and to pre-Socratic times in the West. Each of the eighteen chapters of the Gita has been called a Yoga. Indeed, the very first chapter has the enigmatic title The Yoga of the Conflict (Vishada) of Arjuna. Conflict or suffering itself becomes elevated here to the status of Yoga. It is not merely practical aspects of spiritual life or discipline that have been thus called Yoga, but even chapters devoted to theoretical problems of philosophy, such as Chapter XIII (The Yoga of the Distinction between the Actual and the Perceptual). It is only in the sense of Dialectics that such a term as Yoga in these titles has meaning. The Gita uses a dialectical method to determine a scale of values in life, rather than teaching a particular doctrine. This series of values in the Gita culminates in that supreme Value called the Absolute or Brahman. The Gita is a textbook on the Science of the Absolute (Brahma-Vidya). Discursive reflection does not belong to the Gita, Rather it is a work of mysticism and intuitive penetration. The supreme Value implied in the Gita teaching is attainment of identity with the Absolute, personified in the Guru here who happens to be Krishna. That the Guru and the Absolute are one is not a new proposition in Vedanta. Stress on devotion to a Guru cannot be considered a form of theism but is only normal to wisdom teaching in India. The Gita is meant by the author to teach one doctrine only. This teaching is that of a complete bipolar affiliation between the contemplative and the pure Absolute as one of the most important prerequisites for attaining to full wisdom of the Absolute. The key to the proper appraisal of the Gita consists in the recognition of the Gita as a dialogue between a wisdom teacher and a disciple, a Guru-sishya Samvada. All wisdom teaching implies a representative questioner or a doubter who is sceptical of the doctrine propounded. Such a person typifies and sumps up in himself the position in regard to the wisdom in question, and is known in Vedantic literature as the purva-pakshin. The Guru himself, who gives the revised, revalued or restated version of the wisdom in question, represents the siddhantin, the one of finalized or accomplished view. Between the two poles represented by the Guru and the sishya, there takes place what we call the dialectical revaluation of the wisdom. The core of the Gita therefore consists of a dialogue on the most secret aspects of Upanishadic wisdom. If the Upanishads are considered as original wisdom-texts or Shrutis, there is no reason to exclude the Gita from such a category of literature, when we know that Vyasa (the author) inserted this dialogue between Guru and Sishya in a larger epic poem, the Mahabharatha, for other reasons. It should further be noticed that there is the use of the word samvada (dialogue). That this dialogue was not intended to be merely one between the charioteer Krishna and the warrior Arjuna is made sufficiently clear to the reader early in the second chapter, where Arjuna refers to himself as a sishya or disciple. The Guru is not so directly mentioned there, but only in another context in chapter XI, verse 43: “You are the supreme Guru”; but given the disciple, the teacher is to be understood. The situation demands him, by implication. Thus, although Krishna is successively a Charioteer, Friend, Adviser, Divine Person or Representative of the Absolute Principle, there is no violation of meaning to call him Guru over and above and inclusive of all other relationships. He is not however, a Guru like Bhishma or Drona, who are referred to as Gurus, but a Guru in a more absolute sense. He is called the Lord of Yoga (Yogeshvara), which is also not inconsistent with Guruhood. Krishna refers to himself as representing the Absolute in its different aspects in chapter XIV, verse 3 “My womb is great Brahma — supreme Deity” and XIV, 27 “For I am the basis of the Absolute and the unexpended nectar of immortality, and the eternal way of right conduct, and of lonely final happiness,” and in many other places. These indications are more than sufficient to justify our taking the greater portion of the work. If the Gita is to compared to a lotus flower (it is called Bharata Pankajam, “Lotus of the Bharata”), such a lotus would have many protective petals covering its heart. The core of the lotus with its fragrance would represent the dialogue portion set down by the son of Parasara (Vyasa)m which contains the wisdom of the Absolute stated as revealing itself to the supreme Sun. Protecting such a precious teaching are the outer features that accompany the teaching only indirectly, and which refer to the epic’s war situation. These latter have to be treated as incidental to the Gita, although not to be treated as having nothing to do with the resto or as being totally extraneous to the subject matter. It shows that wisdom and spiritual values of life can be applied at any field of action, unlike other texts which employ a similar dialectical method of wisdom teaching like the Upanishads, where the setting is located in the modest hut of the teacher deep in the silent valleys of the Himalayas. Here the author brings the Guru-Sishya samvada amidst a communal war which can be imagined as the most ugliest of all situations possible in human life, that shows how spiritual values and the wisdom of the absolute is all inclusive. The Neo-Platonic philosopher Plotinus employed this method of dialectics almost as in the Gita, unitively bringing together matter and spirit. In modern times Bergson also understood and employed dialectics in developing his metaphysical ideas. Thus we would be in good company still when we say that dialectics is a secret time-honored way of perennial mysticism or philosophy which is based on intuition rather than reason. It yields unitive results consisting of values in life ranging from the most commonplace to the highest. “Engage in activity, O Dhanamjaya (Arjuna), taking your stand on the unitive way (of yoga) discarding attachments and capable of regarding both attainment as the same: in sameness consists the unitive way (of yoga)”. II, 48. “Affiliated to reason one leaves behind here both meritorious and unmeritorious deeds. Therefore affiliate yourself to the unitive way (of yoga): yoga is dexterity in action”. II, 50. “That should be known by the name of yoga — disaffiliation from the context of suffering. Such a yoga should be adhered to with determination, free from spiritual regret”. VI, 23. Here we have two propositions stated together, one being the counterpart of the other. This is not a type of reasoning which is strictly syllogistic. There is no middle term and the principle of contradiction is not availed of, nor that of an excluded middle. If we try to place this form of argument in the context of the Tarka Shastra (Textbook on Logical Reasoning Method) of Annam Bhatta of the Nyaya-Vaiseshika school, we find that instead of abhava (non-being) postulated by them, we have here a vague middle-term entity, which is admitted and put forward by implication as possible. None of the dualistic schools could be meant here by the reference to philosophers. This way of reasoning has its background in the Upanishads and the Vedas themselves. To cite but one instance, we have the famous reference to vidya (science) and avidya (nesience) which are taken up in the Isha Upanishad for dialectical treatment side by side with the parallel example of the two concepts of sambhuti (becoming) and vinasha (extinction). There is reference to ancient philosophers even there who were capable of treating these two counterparts together, as implied in the expression ubhayam-saha (bearing both) used there. The expression ubhayam (both) is characteristic of this rare type of philosophical reasoning employed also in Gita. “Pleasant, unpleasant and mixed benefits accrue in the spiritual progress beyond of the non-relinquisher (atyagi) but none anywhere for the renouncers (samnyasis)”. Here the question involved is one of comparing the renouncer (samnyasi) with the relinquisher (tyagi). But instead of more simply and directly accomplishing this task by taking a relinquisher and a renouncer, both of whom have points of similarity, this verse takes the non-relinquisher and compares him with a renouncer. The atyagi has nothing in common with the samnyasi, but there is a common ground to the imperfect, humanly conceivable samnyasi and a tyagi who is quite advanced in spirituality. So by opposing the full samnyasi and the non-tyagi, we arrive at a conclusion where the samnyasi and the tyagi have a common ground wherein one is as good as the other. The method implied here may be said to be that of DIALECTICAL REVALUATION of both renunciation (samnyasa) and relinquishment (tyaga) in the light of the neutral Absolute. The middle way common to both the tyagi and the samnyasi is the path recommended by the Gita. “One who is able to see inaction in action and action in inaction, he among men is intelligent; he is the one of unitive way (yogi) while still engaged in every (possible) kind of work”. The relation between action (karma) and inaction (akarma) here cannot be one of complete mutual exclusion with any middle ground between them. There is a possibility implied that action and inaction could exist neutrally in one and the same person. For examples we should have to turn to the paradoxes of Zeno, the pupil of Parmenides. Very clever commentaries have been lavished by intelligent thinkers on the possible meaning of these contradictory requirements. Some explain it dualistically; others insist on giving a strictly non-dualistic meaning. The neutral Absolute is attainable only to a certain rare type of reasoning sometimes called intuition and at other times direct awareness. Sankara refers to this faculty by the term uha-poha, a double way of thinking where there is a forward and backward movement employed in arriving at certitude. When the methods of comparison and contrast are employed together in a certain organic way, that would correspond to what this way of reasoning represents. Apparent paradoxes give up their intrinsic verity and are solved by the same intuitive method. The term nearest to this type of reasoning is “dialectics”, which we have already explained. The anterior wrong opinions which are subjected in the Gita to such a process of revaluation so as to yield the teaching of the Gita in its finalized form may be discussed conveniently under the following categories: (1) The path of the Ancestors (pitriyana) and the Path of the shining Gods (devayana); (2) The Rational and Pragmatic Approach (samkhya) and the Approach of Self-Discipline (Yoga); (3) Sacrifices, Austerities and Offerings; and (4) Renunciation (Samnyasa). 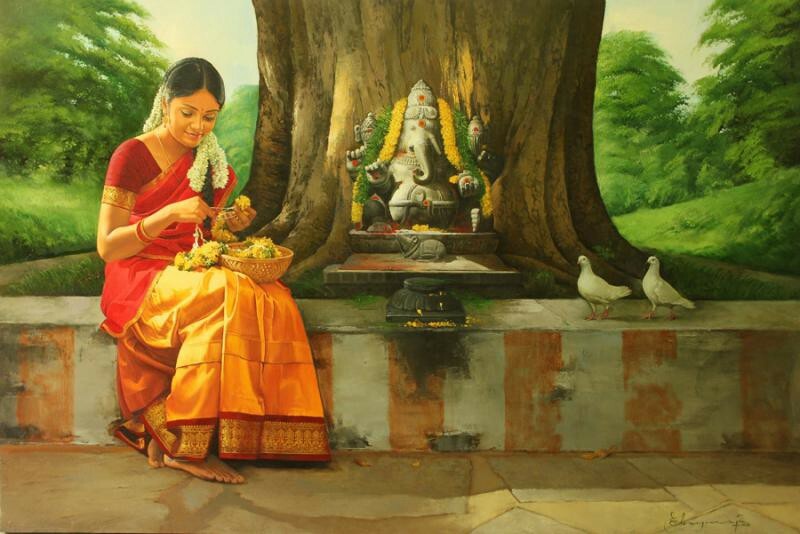 Pitriyana and Devayana: Pitriyana is the path of the ancestors. This is a widely prevailing form of religious or spiritual life not only of India but of the whole world. 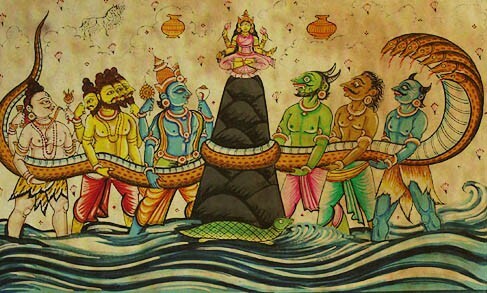 Before the Aryans, who brought the Vedic sacrifices with them which referred to the shining gods (devas) such as Indra and Varuna, the vast matrix of Indians had ancestral forms of worship. Arjuna himself is somewhat representative of this ancestral formation, although he may have been familiar with Vedic worship too through his preceptor Drona. Both pitriyana and devayana are revalued in the Gita in various chapters. 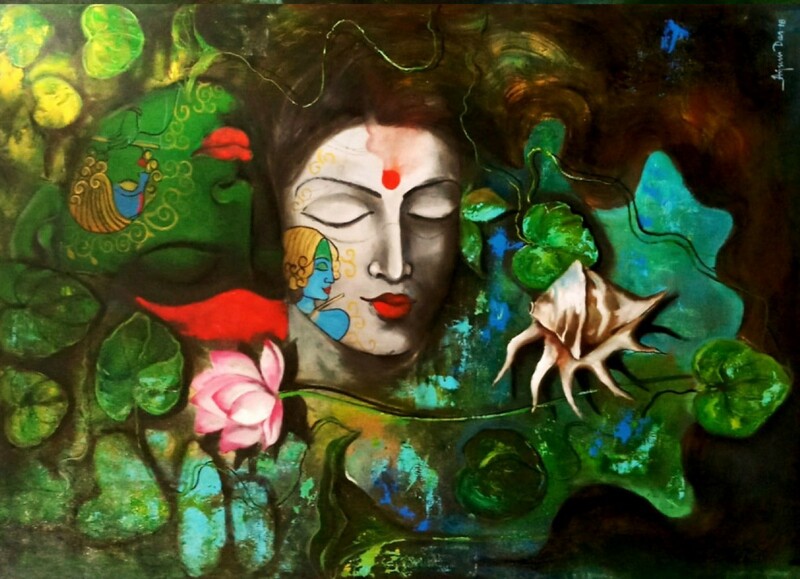 The characteristic silence of Krishna that we have noticed, to the philosophical and religious scruples of Arjuna, in the first chapter, shows that both the ancestral way and the way of the gods are meant to be replaced by the thoroughgoing Absolutist way. This revalued way includes both of the old ways as flooded area can hide an old well — to use an analogy emplyed in Gita itself in II, 46. “There would be as much use for all the Vedas to a brahmana of wisdom as there could be for a pool of water when full flood prevails all over”. This is the first case of revaluation which Gita student has to keep in mind. “That rationalism (Samkhya) and unitive self-discipline (Yoga) are distinct, only children say, not the well-informed (panditah); one well established in any one of them obtains the result of both”. “That status attained by men of rationalist persuasion (Samkhya) is reached also by those of unitive self-discipline (Yoga); rationalism (Samkhya) and Self-discipline (Yoga) as one, he who sees thus, he (alone) sees”. “(For him) the Absolute (Brahman) is the act of offering, the Absolute is the substance offered into the Absolute which is the fire offered by (him) the Absolute, the end to be reached by him being even the Absolute by means of his peace supreme of Absolutist action”. “Whatever meritorious result is found implied in the Vedas, in sacrifices, austerities and offerings (gifts), the contemplative who is unitively established, having understood this (teaching here) transcends all these and attains to the supreme primal State”. “Whatever is sacrificed, given or done, and whatever austerity is gone through, without faith it is called ASAT (non-existent, no-good), O Partha (Arjuna); it has no value here or hereafter”. “He whose reason is unattached in situations, whose Self has been won over, from whom desire has gone, by renunciation (samnyasa) he reaches the supreme perfection transcending action”. Such a task of dialectical revaluation, however, involves a progression in the arguments proceeding from stage to stage. The eighteen chapters of the Gita thus forms different steps, cross sections, or distinct frames of reference, and between each of them there will be differences of angle of vision which many may tend to treat as contradictory statements. Viewed in the light of a sweeping, generously conceived and comprehensive dialectical revaluation of the whole range of spirituality, and taking representative sections for convenience only, the apparent contradictions, which might appear glaring at first sight, become perfectly compatible with the general teaching of the Gita. The Gita is not a book of good luck, nor an encyclopaedia, nor is it one whose philosophy is lacking in organic unity. It is true that a vast range of subjects has been touched upon by the author. Merging the self in the Absolute Self finds mention side by side with dietetic questions, or gazing at the tip of the nose or offering a fruit or a flower to God. In the light of the structure of the Gita as we have explained above, and in the peculiarities of the treatment as a dialectical revaluation of anterior spiritual notions, it will be readily conceded that the charges of being eclectic, syncretic and even solipsist, would not apply to the work. The perfection of the structure of Gita, when examined in detail, would also refute the possibility of interpolations in the text, by which, according to many scholars, it is married. The truth is that the Gita has not been subjected to serious study in the same sense that, Shakespeare has been studied. This has been its misfortune. As a result, political and religious adventurers have taken advantage of the Gita to support their own favourite doctrines.